On the second day of 2017’s Autumn season we walked through the streets of Little Italy amidst all the festivities. 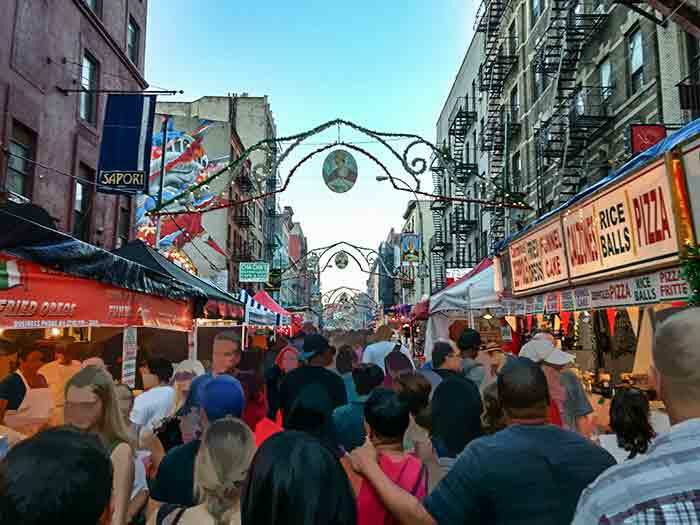 It was the eve of the last day of the San Gennaro Feast at roughly 6:00 pm and the crowds were jam packed. Thankfully, it appeared to be an undeclared collective choice to all walk in the same direction. Otherwise it’d have been quite the mess. Yet even a mess of that kind isn’t half bad considering the song in the air, the smell of the occasional food vending booth and the peaceful pace kept by all the people. No, nothing down here could be considered a mess considering how we’ve walked through Times Square, that’s never as crowded as this, and yet there’s always been a jostling feel of mayhem up that way. Not here, not today in Lower Manhattan. Having run for over 90 years this celebration’s obviously still going strong. The strong, inviting scents of sausage, meatballs, cheese and heavy-sauced Italian dishes fill the air. Folks are eating at tables on the streets while nearby a vendor sells cannoli; others further along sell calzones, sweets and other Italian food items. 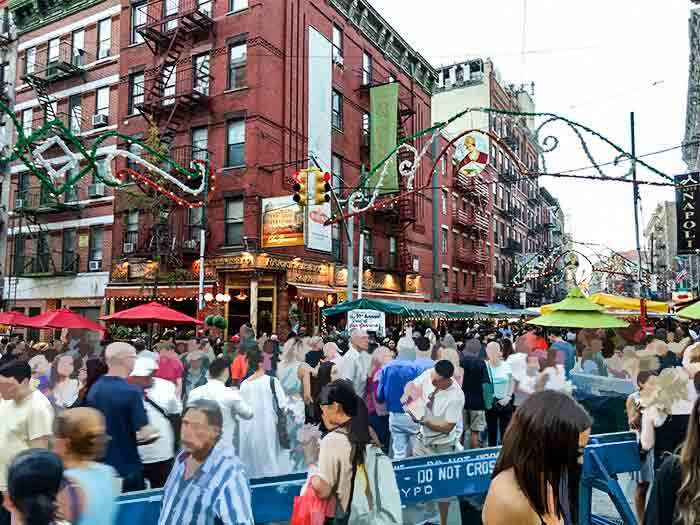 No wonder it’s called the ‘Feast’ of San Gennaro. There’s also the live entertainment. We were only there on one evening but as I understand it, the music goes on nearly every night. On this particular evening, at the Grand Street stage, we caught sight of radio personality, Cousin Brucie, carrying out a live radio broadcast in front of a large enough sitting crowd. 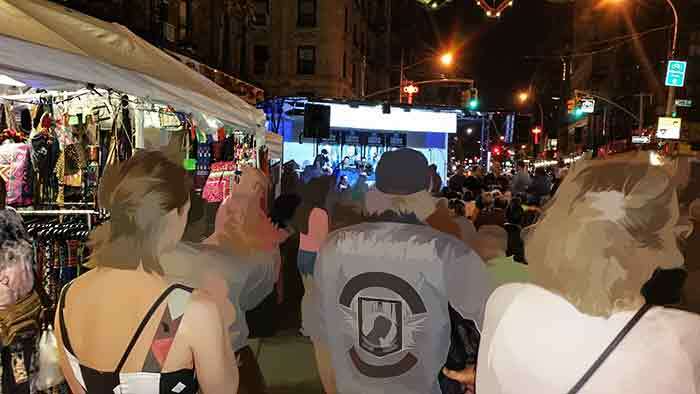 On Hester Street there was another stage featuring a doo-wop groups singing old standards and in front of a number of establishments were solo performers belting out old gems. In addition are all the carnival games, the Ferris-wheel and other offerings. 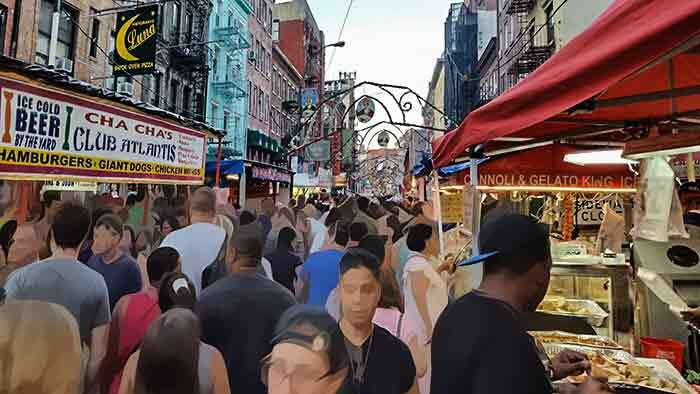 With the throngs of people participating in this affair it looks as if the San Gennaro feast may very well be carried out for yet another 91 years. Here are some photos taken at the festival with faces intentionally blotted for the sake of respecting folks’ privacy; as well as quick video of the Ferris-Wheel.